As I mentioned in my last post, I attempted a patriotic wreath back at the very end of June but never finished it because it wouldn’t be up long before the 4th of July was over. I went to Michael’s a few weeks back and got all happy and giddy inside when I saw the fall items out! Fall is one of my favorite seasons! 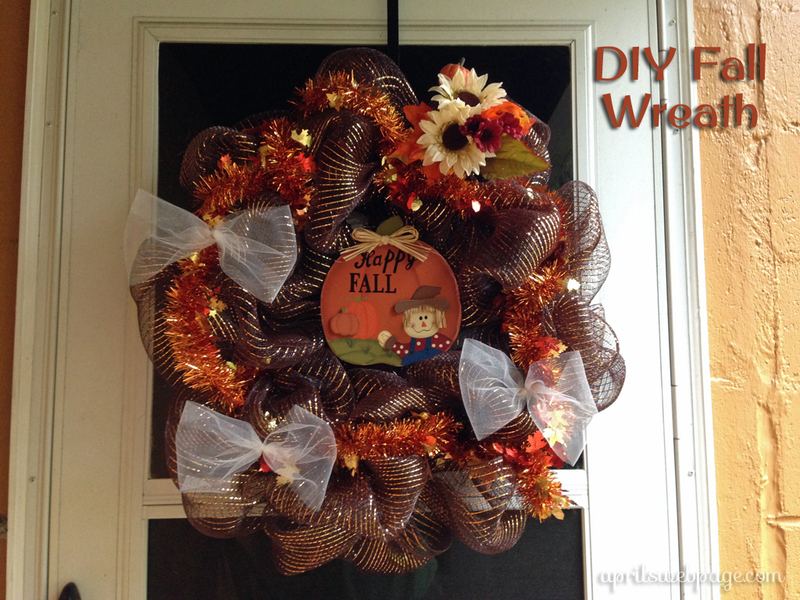 The urge to make a fall-themed wreath was strong. I decided to just reuse the wire wreath base from the patriotic one I’d started since it was HUGE. I wound up using a little over a roll of deco mesh on that one for the bottom base, so it was a lot bigger than it was supposed to be. With the fall wreath, I really wasn’t too thrilled with how the tinsel looked as the 2nd layer. Tinsel garland probably wasn’t the best choice, but oh well. Lesson learned there, right? While working on the napkin holder I was making and waiting for paint to dry, I decided to go ahead and finish the fall one. It didn’t turn out too bad, but I had pictured it a lot differently in my mind. It’s not too bad for my first deco mesh wreath. And I have completed it well before fall arrives! That doesn’t stop me from hanging it on my door now. I just wish we had ONE front door and no screen door so it would look prettier hanging up. Our house is weird in that it has a little alcove and a front door on each side. Oh well, I’m just thrilled I finished my first wreath and it’s not hideous!